While watching the Olympics in Sochi I couldn’t help but think of the 1936 Olympics in Berlin. I compared some historic facts. In 1936 Hitler wanted to show the world a recovering Germany after WW I. In 2014 Putin put on an incredible show with state-of-the-art venues to show the world the “new Russia”. For both men their Olympics are “Memorials” forever connected to their names. One fact stood out: Hitler, watching the games surrounded by his officers and body guards, shook every Gold Medal Winner’s hand as they walked up to him. An unexpected black man, Jesse Owens from the US, won the first of four gold medals in the 100 meter dash. The world press reported that Hitler stormed out of the stadium, angry that a ‘sub-human’ beat his Aryan super-athletes. It was the accepted version of what happened that day. 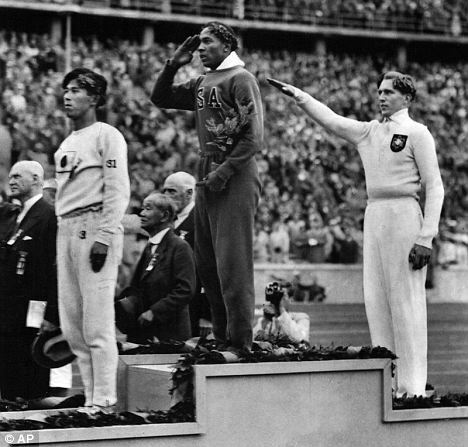 It wasn’t until the sixties that a journalist, Mr. Mischner came forward and reported Jesse Owens had shown him a photo with Hitler shaking his hand and declared: “It was my proudest moment. I was treated better in Germany than I was in the US where we blacks faced segregation.” Apparently the photo was not taken in front of the world press but behind the honour stand. Jesse Owens died in 1980 but always claimed he had not been snubbed by Hitler but rather that the world press had been reluctant to make the monster Hitler look good. Mr. Mischner wanted to set the record straight before he died and stated that other journalists had seen the photo as well. Most people still believe the original version of what happened. “These were the true athlete’s games”. This entry was posted in We Don't Talk About That and tagged Germany, History, Olympics by gmroeder. Bookmark the permalink.